Two exhibitions will be held at Seedboat Gallery at 214 West Yankee Street in Silver City. The opening reception will be held on Friday, October 5th from 5-8pm. Join us! 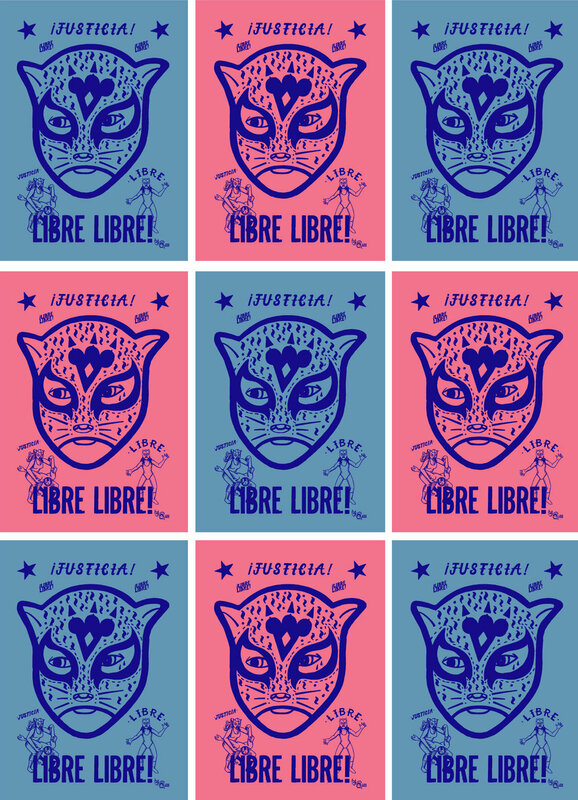 A Juried Exhibition of Political Prints and Posters Exhibition on view October 5-31, 2018 This exhibition is a testament to the visual culture of resistance. Power of Print will be a show of posters addressing the wide variety of political and social issues of our current climate. The exhibition will be held at Seedboat Gallery - 214 W Yankie Street, Silver City, New Mexico 88061. The opening will take place on Friday, October 5th from 5-8pm! Juan de Dios Mora "I’m Chulo"
Horned Toad Prints is very proud to bring its latest print exchange to Silver City, for the 3rd Annual Southwest Print Fiesta. This is the second print exchange organized by Manuel Guerra, print instructor at UTEP, and owner of Horned Toad Prints studio in El Paso. The print editions came from all over the US and Mexico; with one print each from Canada, England and Australia. The 53 prints (all 8 x 10 inches), include etchings, lithographs, serigraphs, relief and prints by other techniques. The Horned Toad II exchange has been shown previously in Oaxaca in 2017; and in Monterrey, Mexico, El Paso, Texas, and Yuma, Arizona in 2018. The print fever does not end here however. The success of this exchange has provoked the upcoming international print exchange, between the US and Mexico. Printmakers from both sides of the border are currently churning out editions for the -- Ambos Lados International Print Exchange -- which is being organized by both: Horned Toad Prints in El Paso, and Taller Grafica Libre in Zaachila, Oaxaca. The first exhibition is scheduled next March, for the 2019 SGCI print conference in Dallas. However the print momentum goes back at least to 2012. It started with the "Dialogs and Interpretacions" series of international print exchanges , from 2012 - 2015 (organized by Jules Floss of the US, and Jorge E. Rodriguez Osorio of Colombia). That inspired the first Horned Toad print exchange, which in turn provoked the YayBig Print Exchange in 2014 (run by Joe Marshall of Tucson). Then printmakers from both the first Horned Toad exchange and the YayBig exchange converged to make a larger print portfolio -- the Desert Triangle Print Carpeta -- by artists from Tucson, El Paso and Albuquerque, which has been exhibiting in both Mexico and the United States since 2015. Southwest artists do not always get the attention the deserve, unlike the California and central Texas artists, not to mention our counterparts in Eastern Time. Our talent often gets swallowed up by the desert and dries up, as if Mountain Time were some kind of Bermuda Triangle. So we are particularly pleased to be showing in Silver City, the center of our region. Prints travel easily, so we if can make an impression first here in our region, then we can move out of the Southwest and intrude into other areas of the continent. Good things may happen if we continue this print momentum. Light Art Space, located at 209 W. Broadway in Silver City’s historic art district will hold a reception on Saturday, October 6th, 3 – 7pm featuring the work of the Arizona Print Group. The Arizona Print Group (APG) is a professional organization of printmakers from around the state of Arizona who are united in the practice of hand-pulled, original fine art prints. The membership shows work locally, as well nationally, and many also teach and give workshops. This exhibition feature work from two of the APG series: “Squared” and “Color Blind”. Techniques include silkscreen, Monotypes, Serigraphs, Linocuts, Intaglio, Photopolymer gravure, and Woodcuts. Also on exhibit will be Age & Seduction, photopolymer gravures by Karen Hymer. Both exhibits run through December 22nd. Gallery hours: Thursday, Friday, Saturday 10am – 5pm and Sundays 10am – 4pm and by appointment. For information visit lightartspace.com, email us at info@lightartspace.com or find us on Facebook. Phone: 520-240-7075.